Chrome Extensions allow you to extend any website out there to provide additional features. There are a number of Strava specific extensions already out there with StravistiX being by far the most popular. 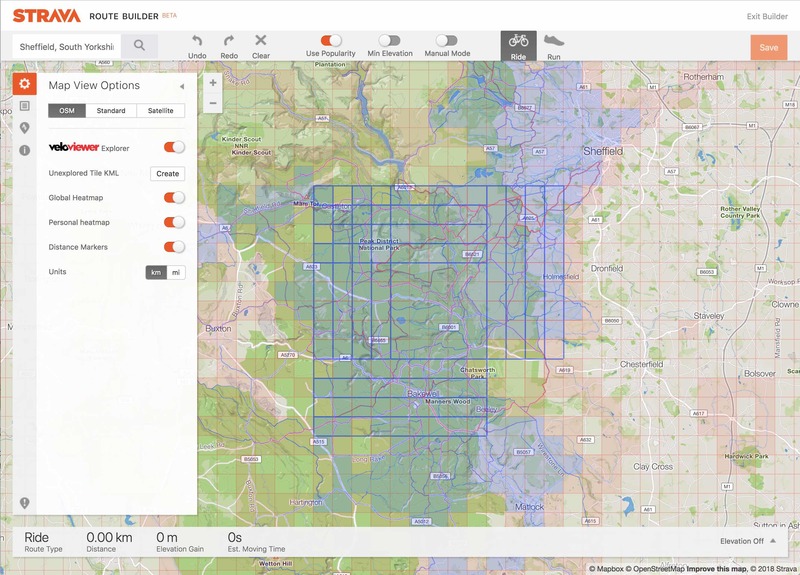 I’d had numerous requests over the last year for a way to plan routes whilst seeing the explorer tiles so the most obvious way to do this was to use an extension that extended Strava’s Route Editor. And while I was at it I may as well add a bunch of other handy links directly back to VeloViewer as well. Update (18th Sept 2018): Personal heatmap option added to the Route Builder. Head to VeloViewer extension in the Chrome Web Store (opens in new tab). Please leave a rating to make it easier for others to discover! That’s it. Now when you visit the Strava site you’ll see the VV icon in the top right of your browser window light up to show that it is running. There is also the ability to create and download a KML file for the unexplored squares in the current view. You will need to have the Explorer option turned on and not be too far zoomed out otherwise the KML file can get too big. As long as you can see the explorer tiles on the map then you can create and download the KML file. You can view this KML file in the maps.me app (available on both iOS, Android) which provides offline OSM maps when you’re out and about so you can confirm you have properly entered that required tile. The option to view your personal Ride and Run (All-time only) heatmaps is also available. Personal heatmaps are only available to Strava Summit members and can be created on your Strava Personal Heatmaps page. Lots of people had asked about being able to view segments in VeloViewer that they hadn’t previously completed (so don’t appear in their lists). This has always been supported (you could create a Route and view that in VeloViewer to see its segments) if you knew the correct URL but now hopefully it will be very easy to do using this extension alongside the Strava Segment Explorer. 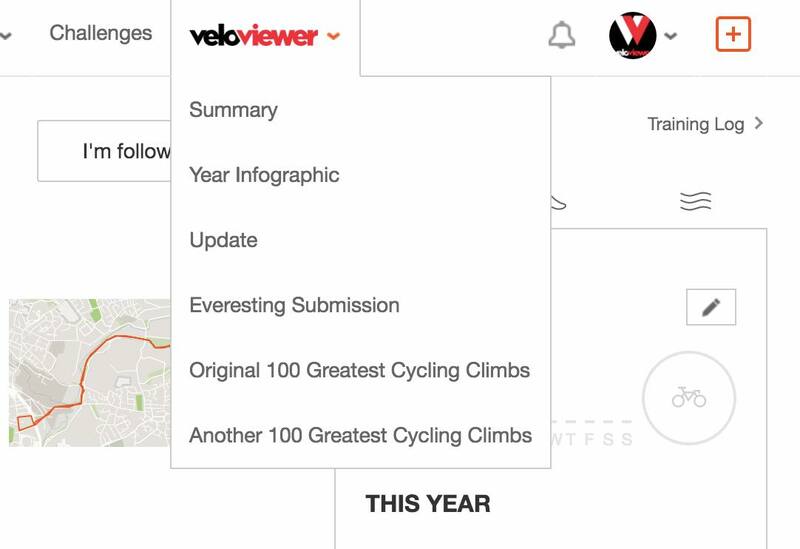 Let me know in the comments below (or via email) if you’ve any other ideas for what this extension could provide on the Strava site but bear in mind it would need to be things that link between VeloViewer and Strava rather than replicating bits of VeloViewer in the Strava site. Pingback: Veloviewer explorer tile bagging. | monaxle: bike behind! It would be great if there could be a similar integration in to RWGPS ?? It would be great if I could filter the tiles I have explored by date. This would make it easier to build routes to increase my cluster number for the year. Yep, you can do that. Just use the “When” filter on the Activities page to select the current year and then you’ll only see the tiles ticked off for this year. sorry, I did not explain properly. 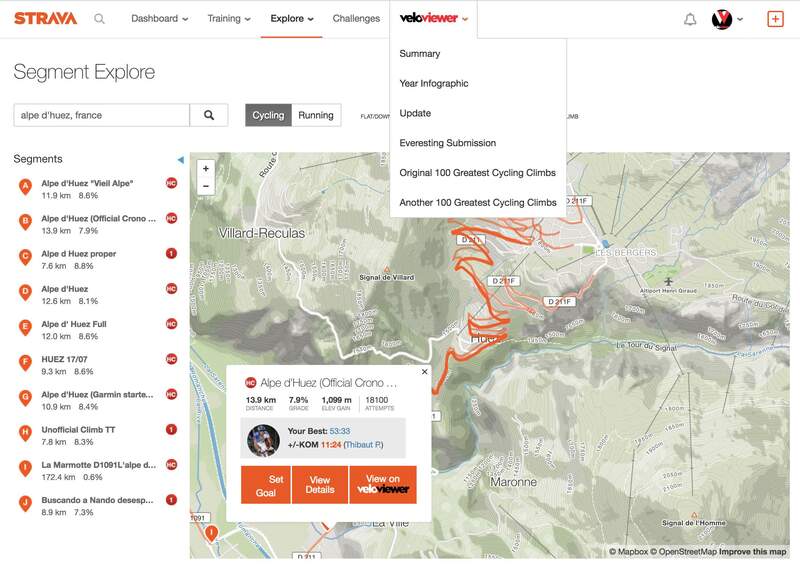 I meant if we could do that in the Strava route builder page with the plugin. I currently do as you suggest in Veloviewer and then flip back and forth to the Strava route builder page. If I have visited a tile last year but not this year it will show as blue. Can you explain how synchronisation between Veloviewer and the Strava plugin is done? My tiles are updated in Veloviewer, but it takes a while (hours, days) before the Veloviewer Strava Plugin knows that there are new, colored tiles. Can I, as a user, speed up this process or do I just lay back and relax until the plugin is updated? I switched off and reactivated the plugin, but that had no effect. Thank you for your answer. The Explorer tile file used by the Chrome Extension is populated when you visit your Summary page following either an update or after the creation of the set of definitive tiles for an Activity. The file being used is timestamped in the file name to avoid any sort of caching issues. At least that is how it is supposed to work!